China, U.S. Rushing To Resolve Crisis Over Blind Activist Chen : The Two-Way With Secretary of State Hillary Rodham Clinton and Treasury Secretary Timothy Geithner due in China for economic talks that start on Thursday, the two countries are talking about Chen Guangcheng, who escaped from house arrest earlier this month. 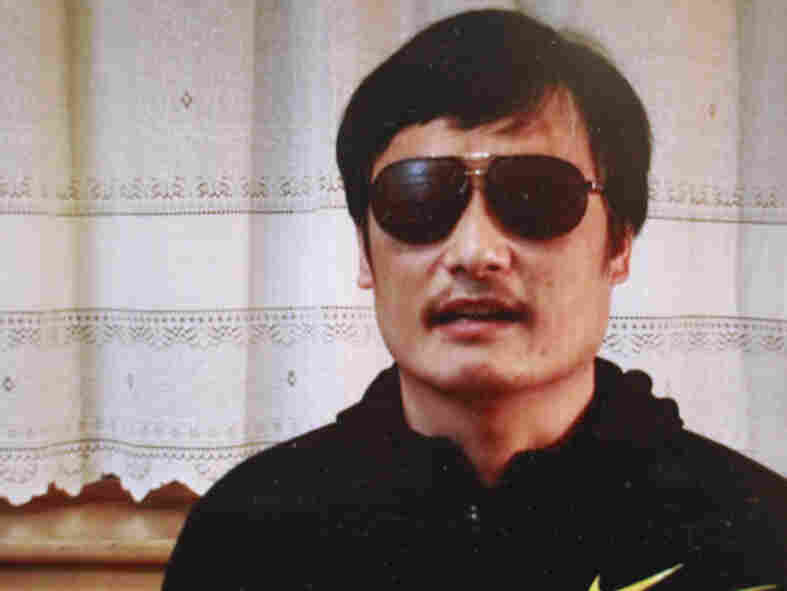 With Secretary of State Hillary Rodham Clinton and Treasury Secretary Timothy Geithner due in China for economic talks that start on Thursday, the U.S. and China are rushing to avert a diplomatic crisis over the fate of blind human rights activist Chen Guangcheng. Chen Guangcheng, in an image from a YouTube video. Chen escaped from house arrest earlier this month. Amid unconfirmed reports that he has found refuge at the U.S. embassy in Beijing, "sources in touch with the State Department tell us there's a push to sort out a deal for Chen and his family before the official talks between the U.S. and China kick off," CBS News reports. "Assistant Secretary of State Kurt Campbell is said to be involved in tense negotiations over Chen's fate." "If the Americans agree to take Chen in, that removes him as a potential distraction within China and serves a gracious concession on behalf of the party ahead of the upcoming summit. It isn't the ideal situation, but given the disaster that Chen's escape could have become, it's a chance turn a failure into a positive. Plus, the Americans get to say they took a stand for human rights, while simultaneously doing the Chinese a 'favor.' "
But as NPR's Louisa Lim and CNN's Steven Jiang report today, the way Chinese authorities are clamping down further on social media is a sign of how sensitive the situation is. "There's a long list of forbidden terms on Chinese Twitter-like services, words for which searches are banned. In recent days, the list got longer still. Freshly banned words include 'blind man' 'U.S. embassy' and 'consulate,' as well as 'Chen Guangcheng.' "
"Outside a busy Beijing subway station Monday, CNN randomly asked more than three dozen people about Chen — only two had heard of him and his escape. One, ... a young man who declined to give his name, said: 'It was all over Weibo [China's largest microblog service] for a while before the topic was censored.' "
Jiang adds that after he posted online about a web video that implied Campbell was in China to negotiate over Chen's fate, " 'StevenCNN' — my Weibo name — has become a banned search term."